The 2017 San Diego County Fair came to a close Tuesday and fair officials have shared some interesting stats from this year's festivities. 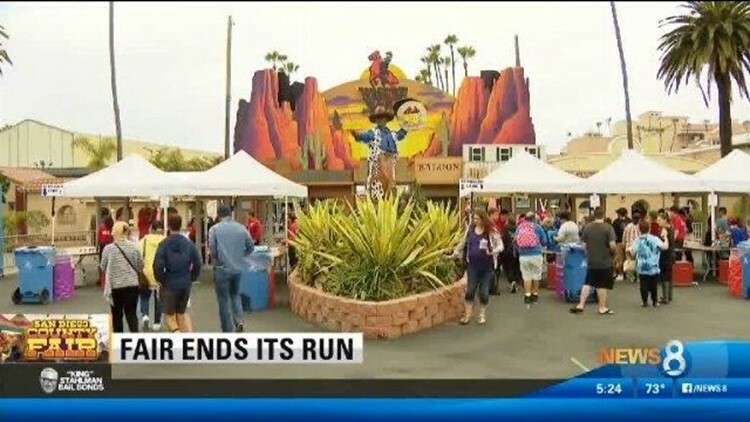 DEL MAR (NEWS 8) — The 2017 San Diego County Fair came to a close Tuesday and fair officials have shared some interesting stats from this year's festivities. One thing the fair is known for is its creative – and sometimes strange – food offerings. More than 30,000 pounds of bacon was used by Bacon-A-Fair this season in their various offerings. Chicken Charlie sold over 30,000 peanut butter meatballs - which News 8's Steve Price sampled in May. Pink's sold 2,600 pounds of hot dogs and 7,500 pounds of French fries. Dixie’s Donuts fried more than 281,000 mini donuts. Biggie’s Meat Market used three-quarters of a semi-trailer truck filled with potatoes for their Curly Fried Cone. 11,000 stuffed animals collected for needy local children via the fair's yearly Care N' Share Toy Drive – a new record! Rides of all shapes and sizes are another popular feature of the fair each year and 2017 was no exception. This year fair officials say the top 10 rides were: Crazy Mouse, The Big Wheel, G-Force, Magnum, Sky Flyer, Olympic Bobs, Fast Track Slide, Alien Abduction, Rave Wave and the Infield Carousel. The Bungee Plunge was also a popular attraction with an estimated 2,500 people jumping off (about 50 people got cold feet). The youngest jumper this year was 8 and the the oldest was 71. Of course, the biggest numbers came in the form the fairgoers themselves. Between June 2 and July 4 more than 1.5 million people attended the fair – the second largest attendance record in the fair's history (the largest was in 2016). The largest single day attendance this year was July 2.